to save Granny's ranch from crooked Land Agent! Timothy Sander and Mark Parquette sport the spoils of victory. Timothy is the first person to ever wear our new Trucker's Cap, and Mark walked away with a Cold Death Stein. HOUSTON, Texas -- For the fourth consecutive year, the OwlCon Owlhoots have have fought the law... and this time the law did not win. Gutshot co-creator Mike Mitchell was on hand to represent the Gutshot Posse at the 24th annual OwlCon, Houston's premier gaming convention. The convention maintained its usual time and venue: the first weekend of February on the campus of Rice University. 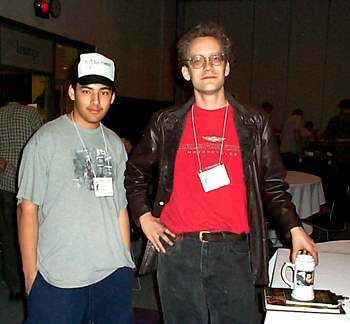 "I always have a great time at this convention. 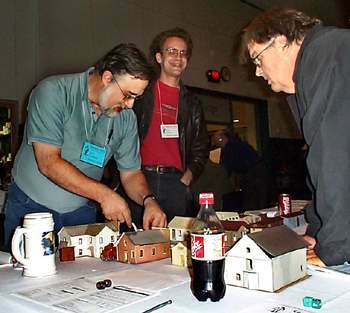 It's always like coming home when I break out the miniatures and buildings at this con," Mitchell said. "This year was particularly special because it's the last year of playtesting -- next year we'll have the Gutshot Core Rulebook finished and ready for sale." This year the playtesters gathered to save their sweet Granny's ranch from a crooked Land Agent in an adventure called "Bushwhacked in Beaver Creek." The adventure was originally played during the Midnight Riders Summer Campaign and will be featured in the Gutshot Campaign setting, Gutshot: Adventures on the Outlaw Trail. The Campaign setting is scheduled for release after the core rule book is completed. "After we finish the rules, we're going to write up a lot of adventures for you to play. The first adventures will be based on those we played during the Midnight Riders campaign. These adventures will follow a group of young outlaws as they try to make a name for themselves," Mitchell explained. "Right now there is no definite release date for this campaign guide -- in fact, much of it will probably be released as free downloads online as PDF files." Plans for the PDFs and subsequent book are still in very early stages of development, he added, promising to reveal more about it as the project progresses. Mark Parquette prepares to flank around the alley to take a chance at heading the villain off before he enters the alley. The basic plot for this game is very simple, Mitchell explained. The crooked land agent in Beaver Creek has swindled your sweet granny out of the deed to her ranch. Even though this is sneaky, it's not necessarily illegal, so the law won't help. So, the mustered up their brothers and cousins and decided to dish out a little back alley justice! They know that the deed is locked up tight in the Land Agent's office (and there is no way they can break in past the barred windows and steel doors), so they decide to jump him and his bodyguard as they leave the bath house on Friday night. The only problem is, there is a Texas Ranger in town looking for them. If he hears a single gunshot, he's going to grab some men and come looking for trouble. So, the gang must subdue the Land Agent and his bodyguard with their fists. "This game was specifically written to force the Players to use the hand-to-hand combat system," Mitchell said. 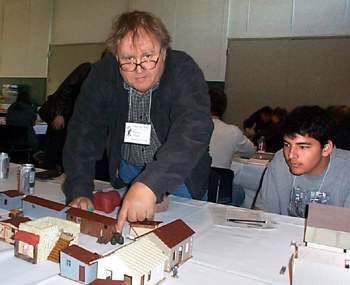 "This is a very important part of our game, which is different from most other Western miniatures systems -- we have a non-lethal combat system that allows you to stage bar fights and bushwhackings." Three players started the game, and were joined by a fourth about half-way through the game. 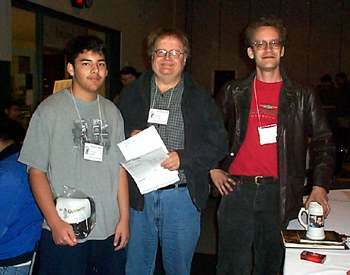 OwlCon regular (and devoted friend to Gutshot) Richard Nelson was on hand, along with newcomers .Timothy Sander and Mark Parquette. Kyle Nearhood -- who played with the Midnight Riders during the Summer Campaign -- joined the action after running a Swashbucklers barroom brawl. "Those games go really fast," Kyle said. "We had time to run two fights." Richard, Timothy, and Mark played two Characters each. Kyle assisted the GM by running the Land Agent and his bodyguard. "Everything went well for the OwlCon Owlhoots until the bodyguard got off a shot and alerted the Texas ranger in the hotel," Mitchell said. "After that, the outlaws had to beat hell for leather to finish the game and escape with their lives, the deed to granny's ranch.... and the $1000 from the safe." "That's one of the things I really love about Gutshot. Every time you play it, it's a different game," Mitchell said. "Even though I ran this game back in June, the strategies tonight were so different that it made it a completely different experience." Gutshot regular Richard Nelson points out the path one of his Characters will take to ambush the crooked Land Agent, Mr. Merriweather. Mitchell added that he's looking forward to sharing those experiences with a whole new group of players when the book finally ships this Fall. "We're very excited about going to press this year," Mitchell said. "We've been working on this for a long time, and it's gratifying to see that hard work finally pay off. There's still a lot of work to do, but we can see the light at the end of the tunnel -- and we're pretty sure it's not a train!" (the other NPCs never really came into play). 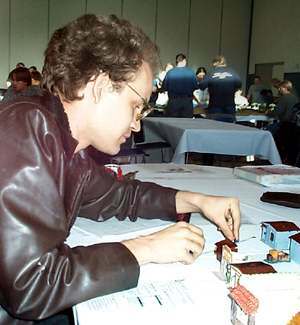 The game lasted five Turns, taking about three hours to play. You and the boys decided to lay low for a while, so you rode into the hills above Rio Gato and stayed with your sweet Granny, who has a small ranch there. You spent your days punching cows and wrangling cattle and your evenings gambling, drinking, and dancing with your beautiful cousin, Carmalita. It’s been a relaxing few weeks, until you found out that Granny has a problem. It seems that the crooked Land Agent -- Mr. Merriweather -- in Beaver Creek had tricked her and several of her neighbors (almost all of them related to you or one of the other gang members) into giving him their original Spanish Land Grants in exchange for bogus land grants. This will allow him to claim their land as his own. If this happens, the kindly aunt (and Carmalita!) will be kicked off their hacienda, and you boys won't have any place to hide out in the future. After snooping around, you’ve discovered that Mr. Merriweather keeps the original deeds in a big safe locked in his re-enforced office (a building that is too sturdy to break into)-- along with a huge stack of cash. Mr. Merriweather likes his whiskey. Every night, around 8 o'clock, the crooked Land Agent goes to the bath house with his bodyguard, Joe. He spends about an hour soaking in the hot water and drinking his hooch. Then, accompanied by Joe, he stumbles through the alley to the back of his office, unlocks the door, enters, relocks it, and spends an hour or so counting his money and laughing wickedly as he plots to evict your sweet granny and her friends. During this time, the Texas Ranger will be in the Grand Hotel across the street from the Land Agent's Office. Friday night at the hotel is in full swing, with cowboys and townsfolk drinking, laughing, and flirting with saloon gals. There's even a gambler in there. If any shots are fired, the Ranger will immediately lead some of the locals to investigate -- armed and ready for trouble. 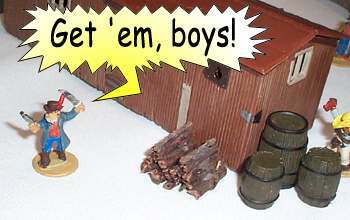 If you boys manage to jump Mr. Merriweather and Joe in the alley without a shot being fired (by them or their prey), you’ll save Granny’s ranch, become local heroes, and make off with the tidy sum in the strongbox. However, If even one shot is fired, the Texas Ranger will be on, leading a mob of 4-10 armed men (1d6 + 3). John McLawson, the Texas Ranger, is in the Hotel (first or second floor, he moves around). 4-10 armed NPCs are also in the main room downstairs. 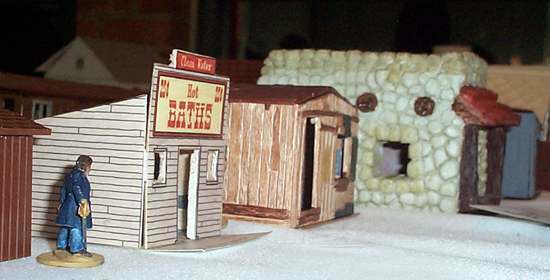 Mr. Merriweather and Joe are in the bath house (the door is locked and the owner is ready with two loaded, sawed-off shotguns). All windows have curtains -- ya can't see it. Jose: Crouched in back of the barrels behind the Land Agent's Office. Jack: In the alley near the long gray and long brown building, pretending to be drunk. George: By the adobe building. Keep in mind, that anyone who is wanted from previous games cannot be standing on Main Street, as they may be recognized (GM should make this call based on how infamous that Character is) by someone who will immediately fetch the Texas Ranger. Most of them should wait in the alley for Mr. Merriweather and Joe. Their horses, saddled and ready to go, are waiting at the Livery Stable (in this game, J.J. didn't show up, so his Character, Thomas Irons, was there keeping an eye on them) can be waiting there, tending them). Victory Points Awarded: If Victory Objectives are met without firing a shot or any NPC discovers that a robbery is taking place, each Character gets 75 VP. If they accomplish the Objective and even one shot has been fired, each Character gets 50 VP. Killing Merriweather is worth 25 VP, Joe is worth 20 VP (divide among those who participate in the killing). If the Texas Ranger dies, each Character loses 10 VP (they have now earned a sworn enemy who will hunt them down like dogs). Restrictions: Merriweather's office is completely secure -- you cannot break into it (pick the lock, come in through the roof, or dig a tunnel up through the floor), you must enter through a door. Likewise, the strongbox is very secure and is bolted to the floor. You must get the keys off Merriweather to get into the office or the strongbox. Remember, if even one shot is fired, the Texas Ranger will be on 'em instantly. Strongbox: $1,000 in gold, a stack of deeds. George got his saber ready while Jack pretended to be drunk in the shadows between the two long buildings. Suddenly, light flooded the street as the door to the Bath House opened and Joe the Bodyguard stepped out and surveyed the area. Joe moved to the alley and stood between the buildings at the edge of the alley. He noted Jack but ignored him -- drunks were more common than not in this dusty cow town. The owlhoots moved into position, ready to waylay their prey. The others scattered about, adjusting their positions. Durango moved to the front of the land office, George trotted to the top of the stairs of the adobe building, Ned moved from the rocks to the edge of the brown building near the Land Office… all the while John McLawson, the Texas Ranger, paced on the balcony of the Grand Hotel, slowly smoking his cigarette. 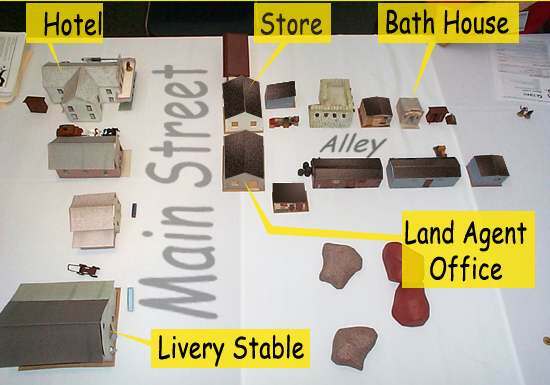 Bill grabbed a piece of wood off a wood pile and moved into the street and hid in the shadows next to the Bath House. Inside the bath house, Fat Louie was cleaning up as Mr. Merriweather, the crooked land agent, finally stepped outside into the cool night air. Mr. Merriweather paused only for a moment in the doorway for a moment before moving into the dark alley, and the fastest route to his office. Bill stood there, makeshift club in hand, muttering under his breath as he watched the crook move to his doom. Merriweather moved down the alley, ignoring the “drunk” and failing to notice the other figures lurking in the shadows. Joe moved up behind him, his shifty eyes also failing to notice the lurking Owlhoots. Bill grabbed a piece of wood from a log pile and moved up outside the Bath House, waiting for the crooked land agent to finish his Friday night soak. Atop the adobe building, George waited until the crook was beneath him, and then leapt off the building at him… and missed! George belly flopped on the dirt, taking 3 points of Pain. 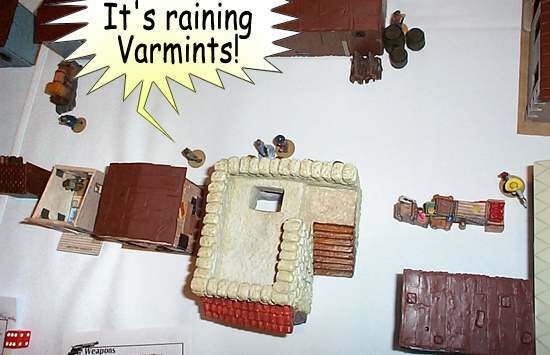 Joe (played by Kyle Nearhood) exclaimed, “It’s raining Varmints!” Amazingly, George’s name was the next pulled from the Cold Death Stein (available in the Gutshot General Store – not-so-subtle-hint!) and got to go again. George pulled himself to his feet and threw a short punch at Merriweather, striking him for a not-too-amazing 1 point of Pain. 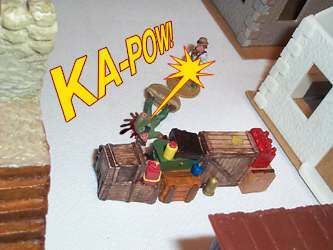 George leapt off the roof of the adobe building, and missed his target! He got a face full of dirt and 3 points of Pain as his friends looked on, wondering if they had botched their chance at saving Granny's ranch. As McLawson was finishing his leisurely smoke on the balcony of the hotel, Bill lunged at Joe and bashed him for 7 points of Pain. Ned trotted up on Joe and threw his Bowie knife, but missed. Jose ran at Merriweather as Joe the bodyguard punched at Bill, who managed to block. Merriweather made an ineffectual kick at Jack and then ran for Main Street, but fortunately Jack had moved into position to block him. Ned attempted to tackle Merriweather, but missed… as did Jack. Fortunately, Jack got to go again and successfully punched him. Merriweather attempted to block and rolled Snake-Eyes! The wicked snake hissed in victory as Merriweather’s pistol went flying and Jack dished out 5 points of pain. Joe saw his boss take the hit and realized that the tide had turned against them, so he pulled out his gun and fired it at Bill. Although he missed, the alarm had been raised! 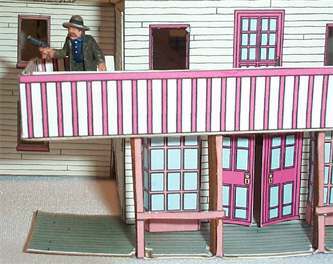 On the balcony of the hotel, Texas Ranger John McLawson heard the shot ring out and knew that trouble was brewing. He tossed his cigarette to the dirty street below and readied to rush down to the hotel lobby to gather the men to investigate. Unfortunately, all of his Action Slips had been pulled from the hat, so the Owlhoots could act with impunity for the rest of the Turn. The Texas Ranger enjoys a slow smoke on the balcony, little suspecting the fate that awaits him as the owlhoots execute their plan. Jack calls the owlhoots to action and they move in for the kill. The Owlhoots, realizing their ambush was about to be discovered by the ranger and his posse, threw caution to the wind. Ned was the first to draw and fire his gun. 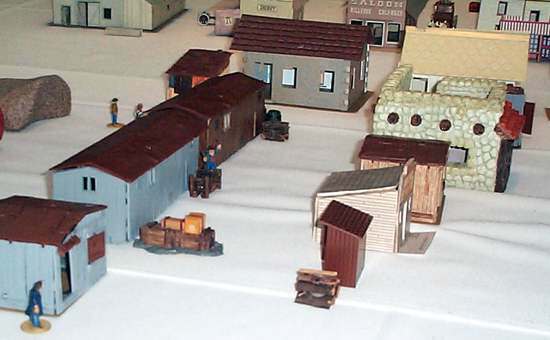 Jose still fought hand-to-hand (rolling boxcars for extra Pain), and Durango rushed up to pistolwhip the crooked Land Agent with his rifle, but failed to connect. Merriweather countered with a kick that failed to connect and Durango got lucky and went again – this time scoring an exact hit on Merriweather for 4 points of Pain. Bill drew his pistol and fired… and Lady Luck smiled on him – he rolled Boxcars! He dished out 9 points of Damage, on Joe (whose Tough-as-Nails Specialty subtracted 1 point from the total). Joe’s retaliation fire was successful: Bill took 5 points. George decided that things were get a bit intense, so he ran and jumped through the Store window and switched to his rifle. In the Bath House, Fat Louie heard the ruckus and realized that one of his best customers was in danger. He grabbed his shotgun and trotted out into the alley, loaded and looking for trouble. Jose drew his saber but failed to draw blood. Bill blasted at Joe again, doing another 6 (-1 for Tough-as-Nails) Damage. Fat Louie closed and emptied one barrel of his shotgun on Bill and missed. However, Louie had the Lucky Specialty and chose to reroll the attack and this time he scored, doing 5 points of Damage. Bill’s retaliation shot missed. Jack drew his shotgun and moved to help, but it was too late – Joe fired again and sent another round of hot lead into Bill’s innards, dropping him hard in a pool of blood in the dirty alley. When the smoke cleared, the first kill had gone to Mr. Merriweather’s bodyguard. First blood behind him, Joe turned and fired at Ned. Both his shot and the retaliation shot missed their mark. Miracle of miracles, though, Ned’s name was next to come from the stein, and the shot laid his attacker low. Clutching his chest, gurgling blood as he fell to the ground, Joe the bodyguard managed to squeeze the trigger of his pistol and retaliate at his killer. Even as he fell dead in a puddle of his own blood, Joe’s bullet found its mark, delivering 5 points of Damage to his killer. The bodyguard's blood puddles in the filthy alleyway as he falls defending his boss, the crooked Land Agent, Mr. Merriweather. Merriweather was making a break for it – he knew if he could make it to the Grand Hotel, he would be safe. He rushed past the Owlhoots into the middle of Main Street. Desperate, Durango fired with his rifle… and missed. Jack sighed, bolted after him, and let loose both barrels of his shotgun. The blast reverberated down the dark streets of Beaver Creek, followed by a ghastly sound of metal on flesh as the shells all but tore the crooked Land Agent in half. Merriweather spun in two different directions as 14 points of Damage cut him down into a lump of warm meat in the street. Jack’s name came from the stein again, and he rushed up to search the warm body for the keys to the Land Office. The others fell back to cover him as the sounds from the Hotel grew louder: the posse was about to emerge! Kyle measures the distance as the Texas Ranger leads his makeshift posse to investigate the gunshots he heard in the alley. The Texas Ranger burst into the street with a small mob of armed men. Even as the lawmen closed in, Fat Louie saw the blood in the street and fell back to his Bath House. Durango took careful aim at McLawson and fired. The bullet streaked through the air, finding its mark for 8 points of Damage! The Ranger’s retaliation shot missed, but he was still able to move the posse closer to the Owlhoots. Meanwhile, Jack was looting Merriweather's body and got the keys to the Land Office. The final Turn was fast and furious. 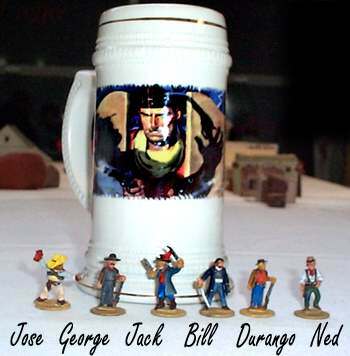 Durango fired again for another 3 points as Jack opened the door to the Land Office. He quickly opened the safe and grabbed the money and deeds. Outside, in the street, Ned fired on McLawson, delivering the killing blow to the Texas Ranger. Their leader dead, the posse dispersed and the Owlhoots finished their plunder, saving Granny’s ranch… but earning the enmity of the Texas Rangers. Still, that was something to worry about another time, for tonight, the OwlCon Owlhoots had killed their foes, saved Granny’s ranch, and made off with a tidy bundle, too boot! Timothy, Richard, and Mark stand triumphant after saving Granny's ranch,,, and collecting their own loot from the afternoon's game.